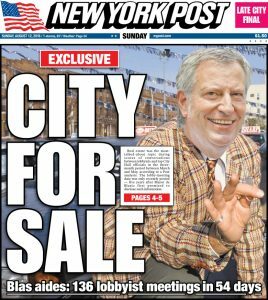 This past Sunday, the New York Post’s exclusive cover story, “City Hall finally discloses lobbyist meetings — and the results are eye-opening” touches upon some of the 136 meetings that the Mayor’s nearest and dearest held with lobbyists during a three month window this past Spring. Disclosing such information was a tent pole of his campaign but those disclosures lagged for months, and were never made during the Mayor’s first term. The article notes that the meetings took place on average 83% of city workdays and more than one-third of all of those meetings pertained to real estate and housing. New York Communities for Change executive director calls this behavior out: ‘this shows they have an open door to real estate developers and corporate lobbyists’. Of those with meetings, Board of Standards and Appeals Chair Margery Perlmutter, who recused herself from a decision on 200 Amsterdam, and reportedly was still the target of lobbying efforts from the developer’s team held sixteen meetings during this three month window. (The BSA subsequently denied the neighbor’s challenge of 200 Amsterdam even after the DOB admitted that they permits should not have been issued in the first place). The Post also reports that recent past Chair of the Landmarks Preservation Commission Meenakshi Srinivasan had nine such meetings with lobbyists…the topics of which are undisclosed. What could this mean for other developments stretching the intent of the Zoning Resolution and Building Codes? The quantity is staggering and may easily lead one to question the role of money in politics, the topic of a New York Times article today: For Voters Sick of Money in Politics, a New Pitch: No PAC Money Accepted. Followed by Sunday’s late reporting “De Blasio lets security haul away Post reporter for asking question“…could this event possibly be a result of the expose? If true, the potential coincidence would be in conflict with the Mayor’s prior support of a free and open press.